St. Martin's Griffin, 9780312380793, 416pp. 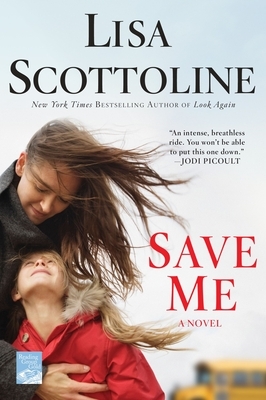 New York Times bestselling author Lisa Scottoline's Save Me will touch the heart of every woman, as its heroine, the unforgettable Rose McKenna, makes a split-second decision that alters the course of her life—and makes you wonder what you would do in her shoes. Nobody could have foreseen what would happen the day that Rose McKenna volunteers as a lunch mom in the cafeteria of her daughter's elementary school. Rose does it to keep a discreet eye on her third-grader, Melly, a sweet, if shy, child who was born with a facial birthmark that has become her own personal bull's-eye. Melly has been targeted by the mean girl at their new school and gets bullied every day, placing Rose in a no-win position familiar to parents everywhere. Do we step in to protect our children when they need us, or does that make things worse? When the bully starts to tease Melly yet again. Rose is about to leap into action—but right then, the unthinkable happens. Rose finds herself in a nightmare, faced with an emergency decision that no mother should ever have to make. What she decides in that split second derails Rose's life and jeopardizes everyone she holds dear, until she takes matters into her own hands and lays her life on the line to save her child, her family, her marriage—and herself. Lisa Scottoline has thrilled millions with her inspiring female characters and her exploration of emotional justice, writing about real issues that resonate with real women. In Save Me, she returns with her most stirring and thought-provoking novel yet. Save Me explores the mother and child relationship, at its heart.What do you think defines a mother?How is a mother and child relationship different than any other relationship?Look at other forms of culture, like art, for example.How many depictions are there of mother and child?And how many of father and child?Are we discriminating against fathers, or diminishing them, by all this talk of the mother-child bond?And by doing so, do we create a self-fulfilling prophecy? In Save Me, Melly is the victim of bullying because of a birthmark on her face.Do you think bullying is different today than years ago?Do you think that the bullying is getting worse, or are we just hearing more about it because of the Internet?What do you think parents and schools should do to help curb bullying?What kind of punishment do you think is appropriate for the child who is doing the bullying?What about those who watch and say nothing?Are they, or aren’t they, equally as culpable?Do you think that school programs and curricula that build up self-esteem and a sense of community will really make a difference? Rose experienced her own bullying at the hands of the angry parents, which gave her new perspective on what Melly was going through.Do you have any experience with bullying between adults?In what ways are adults better equipped to deal with bullying than children?What impact can bullying have on adults, and what can an adult do if they are faced with a bully?What impact does being a bully, or being a bully as an adult, have on their children? Rose steps in to defend Melly against her bully.Do you think it was a good idea?Why or why not?How do you think a parent's involvement hurts or helps the situation?At what point do you think a parent needs to involve themselves in the situation?What steps would you take to help your child if they were being bullied, and how far would you be willing to go? What impact do you think a physical blemish has on a child, and how do you think it effects their identity, their relationship with their family, and their relationship with the outside world?Take it a step further – like how about physical differences, like a child in a wheelchair?Or learning challenges, that aren’t so visible?Or how about discriminations based on race, religion or sexual orientation?Melly's father reacted very badly to Melly's birthmark.What did his reaction make you feel about him? Many of Lisa's books center on single mothers or blended families.Do you think the love of one great parent is enough to sustain a child through life?Does it take a husband, too?Or a village? As Rose found out, volunteering comes with risks.The book makes clear that this is a problem in the law of many states, maybe even where you live.What do you think of the laws in terms of protecting those who volunteer their time?What changes, if any, would you make to the laws to protect volunteers?Should we expand the Good Samaritan statues to include volunteers and to encourage even more people to volunteer? How did you feel about Rose keeping her secret past from Leo?Did you understand her reasoning?Did you agree or disagree with it?What impact do you think Rose's past will have on her marriage as she moves forward?Do you think she will ever really be able to escape what happened?Will he forgive her not telling him?How do secrets impact intimacy in our lives? Rose was called a "helicopter" parent, a term often used in today's society with a negative connotation.What separates helicopter parenting from good parenting?What kind of parent do you think Rose was?What mistakes do you think she made?Do you think she was a good mother?Do you think she favors Melly, or the baby?Or treats them equally? How did you feel about Amanda in the beginning of the book?How, if at all, did your opinion of her change by the end of the book?What do you think causes children to be bullies?Under what circumstances would you ever feel bad for the bully?In punishing a bully, do you think their personal circumstances should be taken into account? What did you think of Rose's lawyers' strategy?Did you agree or disagree with it?Why or why not?Do you think they were just passing the blame, or do you think the school had a responsibility in what happened?Do you think that litigation is another form of bullying?Do you know anybody who is sue-happy?